Now there have been times when I’ve been accused of being a ‘softy’ when it comes to training in inclement weather, opting to go indoors rather than brave the elements. As a coach, I do prefer to train in all conditions as there might / will come a time when players will have to play in them… but there are times when I’d much rather take things indoors to get some real work done (esp. when it’s always rain / cold and many players are out sick, or recovering from). There are also times when it’s just not possible to use the pitch – closed or as many of us in Eastern Canada know, when there’s three feet of snow on it! 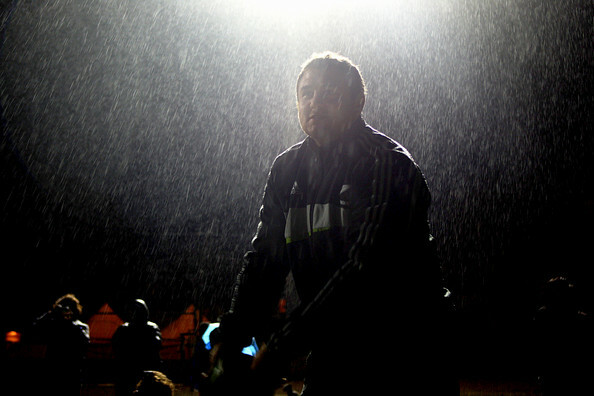 Rugby in the rain and cold. Not always fun! So what’s there to do indoors? Well, hit the gym and do fitness, obviously! … BO-RING! I’m sure most clubs do this and I’m sure most clubs which do struggle to get the entire team to show up. In all honesty, the players most keen about doing fitness probably do lots in their spare time and those most in need tend to skip indoor sessions knowing that it’ll just be fitness! Knowing this (having been one of the latter in my days! ), I advertise that we’re actually going to learn and develop technique and skill at indoor trainings. I actually think the limitations of space can force you to work on things which we don’t usually make time for in outdoor training where we’re spoiled for room to move. Now if you’re lucky to have an indoor turf facility like the one above, you can pretty much do anything as the surface is very forgiving (although I’d advise players to wear long sleeves and socks as the plastic ‘grass’ does burn a bit). But such facilities cost quite a bit to rent, forcing the rest of us to rely on the good old indoor court. So what can you do in there? Technique: We often don’t take time on Tuesdays and Thursdays to work on individual technique, but it’s often a lack of quality in these basic elements which can spoil skill / team based drills. So why not take this opportunity to provide many players with feedback and practice on what they’re most deficient in? Working on passes is the obvious one. These can be done in isolation, with no extra movements, focusing purely on the technique, or placed within some form of game-based scenario to make it more interesting and realistic. (For example, scrum half passes after a little shuttle run to have players pass while fatigued and have to get their feet in the right position.) One could also work on body shape via mini scrums. Lineout pods and throwers. We’ve even done ‘after the tackle’ practice on gym mats, having players work on laying the ball back properly, a defensive player attempting to jackal, and an attacker looking at how to clear out the jackaller. One can add whatever intensity is safe / appropriate, but even done slowly and without intensity, players should be able to work on the finer elements of technique which are often ignored in full speed outdoor training sessions. Skill Elements: Somewhat like the scrum half passing drill mentioned above, simply take small chunks of the game and practice them in isolation. Using the length of a basketball court, one could probably work two forward phases in one direction so a team could work on how they deal with slow ball or forward running / support angles in phase play. Attack v Defence games can be tailored to focus on creating and preserving space (2 v 1, 3 v 2, etc.) or to stress the importance of timing (of runs and passes) in small space for both backs and forwards. You could also work on defenders re-aligning after one phase, getting fringe defence sorted and recognising their responsibilities. Touch: I’ve ranted about poor versions of touch already, so will state simply that most versions of Touch shouldn’t be played indoors. To me, touch is about the creation and use of space and limiting the width, making it a series of pick and goes and crash balls, is actually contrary to what my team (at least!) should be doing on the pitch. … BUT, a year ago we played some pretty effective touch rugby along the length of a basketball gym by adding one little element – the offload. We played 6 v 6 and restricted teams to 4 touches (incl. a 3 step retreat by the defenders after the touch) until they had to turnover the ball. However, if they managed to offload the ball within two seconds / two steps, that touch didn’t count and they could play on. It became an excellent opportunity to not only practice offload timing and support, but for defenders to shut down the offload potential or to adjust to line breaks. Communication in both attack and defence improved greatly, not to mention effective use of space, playing this version! In short, if you’re forced to change venues, still try and make rugby training fun and a worthwhile learning experience! In the Using Video – Part One article, I talked about analysing other people’s (i.e. from television, top level stuff) footage to make use of ideal practices or multiple camera angles and one’s own game footage for certain specific aims. In this article, I’m going to discuss two more ways to use video to benefit your team. Two weeks ago we trialled videoing just two players, each for a half. We chose a forward and a back to focus on and I kept the camera on them with enough width to see what was going on around them. Initially, I thought with rugby being as expansive as it is that we were going to be watching large stretches of ‘not much’ as players are not always involved in the action. I was surprised, however, as even though there were times the camera missed tries or ‘big’ moments, following just one player around really told the story of the match. We didn’t only get the chance to help those individuals understand their strengths and areas for improvement, but we also saw how their units interacted. In choosing a no. 8 and a fly half to follow, we were able to see the general work rate of the back row and how both half backs contributed to our attack. The individuals found the process enlightening and motivating. Seeing one’s self in action can be embarrassing, but when the coaching staff keeps everything positive and constructive the process should serve to push most athletes further along in their development. We didn’t even talk address mistakes, but the athletes would bring them up and say to themselves what they needed to do to improve, having seen it for themselves (especially if they hadn’t realised whilst playing!). I think at this point it’s important for coaches to help the athlete stay positive and look at any ‘negative’ situations on film as an opportunity to improve, which can then lead into some very genuine goal setting strategies. There’s an old adage which goes ‘you play how you practice’ and instead of waiting for games to find areas for improvement, why not try and spot these at training. In games, certain elements might only occur a fraction of the time with certain people. At training, in the proper environment, you could video sections to examine technique or skill for consistency of effort. The obvious ones involve technique – passing, tackling, kicking – where one can use video to get a closer view at specific actions. Put through an easy-to-use program like movie maker, one can slow the footage down and provide the athlete with feedback on how to correct anything that might be preventing optimum performance. I haven’t done it just yet, but am going to film our backs-only sessions because I suspect that providing the team with visual evidence will prove some points I’ve been trying to make. There are times when things don’t go just right, so we provide verbal feedback. This only goes so far, so some of us get them to act out what just happened and ‘freeze’ players to make a point. This would work for kinesthetic learners, but with many more people being visual these days, why not provide that mode of learning as well? In the case I mentioned, I think it’d provide the clearest example of, say, lack of depth (filmed from the side), failing to preserve space with the angles they choose (filmed end-on), or issues with timing or missing clear opportunities (either angle). Despite loving my rugby and being such a passionate coach, I’ve resisted getting back into playing the game because I can’t stand boring and pointless practices run by others. Yes, such arrogance is definite minus on my part, but if I’m to commit time and money I want to enjoy myself and be challenged. One thing that I think would help youth stay more interested in rugby here in Canada (where we are a minor sport that most kids really don’t love as much as they do elsewhere, and who are willing to ‘bear it’ because of that love for the game) is to make training more interesting and rewarding. I’ve seen school boy and club youth training in a few provinces now and the content too often ranges from ‘boring’ to ‘pointless.’ Now I have a particular slant toward using a games approach to my rugby coaching style, but even a few more chances to practice against real people, freely, in large spaces as such should keep things interesting at least. I get the impression from some who can no longer be bothered to play that they never really saw enjoyment in training, didn’t learn much, and so didn’t have much fun in games, even, as all they did was bash it up like they do in League, but without the space those guys get after a tackle ball. The things I see being over-done the most are 2 v 1s in boxes, unopposed team runs, and set piece (scrums, lineouts, pre-planned backs moves vs. little / no defence) sessions which last 45 mins or more! I’m already getting sleepy and annoyed just typing it! Make training more rewarding – even with a high degree of failure, to teach lessons from it – and certainly more fun and I’m sure more youth would stick with rugby! I call these ‘scenarios’ and they’re really easy to set up – just take a piece of the game and let them work on it as if it were real. Set restrictions and/or impose conditions as needed to emphasise the desired outcomes. Make these specific in your plan, as well as to the players, so you can keep reinforcing what you want to get out of the live scenario. If it gets ugly, alter the conditions slightly, but don’t forget that sometimes players have to struggle through the ‘ugliness’ to acquire the skills needed to be successful. What to do about “ball hogs”? I was reading this topic on The Huddle coaching forum today, and rather liked my response! Rather than taking the harsh stance on the supposed ‘ball hog’ I’d have a look at the reasons for this supposition. I’ve worked with players like this in the past who believed (wrongly) options weren’t available outside him or that (sometimes correctly) no one called for the ball. Some players truly do have the blinkers on and don’t see what’s around them. Maybe he has to see himself making these mistakes (in the first case) on video and the rest of the team needs to be more communicative (in the second). My new club has an outside centre with international experience who could be mis-labelled a hog with 17 tries already this season – but in examining the video it’s plain to see that when she makes a break she does a double shoulder check to see who’s with her. Often support isn’t there, so I’ve been working on the other backs recognising her tendencies so they can be in closer support when she makes one of her typical (and they are almost always the same) line breaks. Those who’ve managed to do this since have been rewarded with tries themselves as they get into position and indicate ‘with you left/right’ and she draws the full back and puts them away. I also coached players who truly had the blinkers on, but where the rest of the team wasn’t calling for the ball. 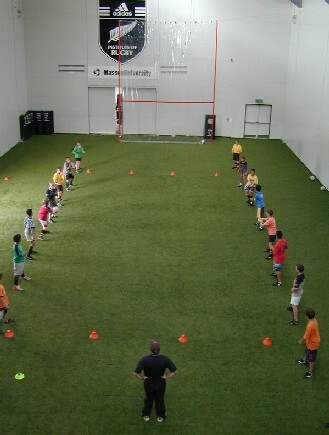 Part of this was them not being able to recognise opportunities themselves, so we worked on that in conditioned games. I also reversed conditions somewhat by saying that passes couldn’t be made unless someone called for it. For the first few goes it was players simply running into the touch and spoiling chance after chance until support got it in their head to actually call for a pass all the time. I’m not so sure if taking early and direct running angles is really for you, given your size but also your outstanding quickness and acceleration. Players like Shane Williams, Maxime Medard, Cory Jane, James O’Connor are all top international wings / full backs who are on the smaller side, and you’d never see them taking those direct lines. Look out for their quick feet and ability to squeeze through small gaps – esp. Williams and O’Connor. In this highlights video, I think two things stand out as ‘trends’ of his brilliance. 1. Note how many of the players he beats are big, slow forwards (or much larger backs without his lateral quickness). It’s not that he’s beating them only because they’re not as quick him, but he realises their very presence in the backline makes it worth having a go against the space around them. There are a couple of occasions where you’d think they’d want to keep passing the ball to use an over-lap or get into more space, but you can almost see him perk up realising ‘Fat, slow player in front of me. Gonna have a go!’ I think for any quick footed player facing such a player should be seen as an opportunity regardless of what the intended move would be. I encourage players to not rely on set moves, but scan for attacking opportunities in the way of obvious space or exploitable weaknesses in the defence (players out of position or alignment, players found to be weak defenders, etc.). Set moves should be the fall back when none of these opportunities exist and the defence is quite organised and disciplined. Williams is very astute at spotting the former. 2. The other is the sudden change of direction – and not for the sake of it – but when specifically when the defender is ‘fixed’ or over-committed. Two sins often committed even at the highest level when playing defence are to sit on one’s heels to accept a supposed tackle, and to over run the attacker when cover defending. In the first instance, players feel a tackle will be imminent, so sit back and crouch to accept the impact when really they should continue to move forward – ‘attack on defence!’, as I say – and be on the balls of their feet to be ready for any sudden changes. In the second, there’s nothing worse than getting beat on the inside as it’s usually impossible to recover from this error and catch the attacker. Players must ‘track’ an attacking player by looking at the inside hip – which not only indicates direction but is also the target for the shoulder in a proper tackle. The ‘tracking line’ to take is one that constantly adjusts as one moves forward and shifts to make sure that attacker can’t step inside but also so they can’t get room on the outside. … and I think Williams is recognising when the defenders haven’t got him properly lined up and/or that he can use his quickness to off-set their tracking / pursuit lines and side step to wrong-foot them and get by. Ball in One Hand or Two? Earlier, I discussed why players should regularly carry the ball in two hands. In that article, I discussed how it allows for quick passes in either direction, a factor which causes defenders to hesitate and not be so quick to commit, unsure of what the attacker will do. But there are times when players should most definitely carry the ball in one hand, notably when off to the races on their own. Players should keep the ball in two hands when it is not absolutely certain they can break away and score. Keeping the ball in two hands allows not only the chance to make quick passes in any direction but in knowing that defenders have to stand off and wait for longer than they would if the ball carrier had the ball tucked away. Tucked under one arm, a defender could reasonably make a quick charge on the ball carrier – even targeting the arm the ball is being held in to attempt to dislodge it. Players doing this often miss chances to put support runners away because even the act of going from one hand to two can be enough time for a defender to shut him down. He might also find that the support is on the wrong side for an easy offload (very few people have hands as big as Sonny Bill Williams and his ability to make spectacular offloads in any direction!). Great players like Stephen Larkham and Quade Cooper have shown that a crafty ball carrier with the potential to put it anywhere can make even international quality players look silly on defence. That little bit of hesitation has seen them, and other players like them, slide through gaps untouched as defenders stand unsure of what will happen next. Finally, it ensures that accurate passes can be made not only before, but also from contact, as opposed to the one-handed offloads which don’t always find their mark or are spilled forward in the tackle. … and you can make awesome plays like this, only possible with quick, two-handed passes. Players are justified in tucking the ball in one arm when they have a clear run and/or no support is near. It is harder to run at top speed without being able to swing the arms, so when a player is free to sprint it’s advisable to tuck the ball in one arm to enable this. It is also a useful technique when contact is imminent and support isn’t present, to either break the tackle or to create separation to buy time for support to arrive and/or make an offload. Aiming for the shoulder provides a chance to prevent the defender from making a ideal and solid tackle and, done with either enough leverage or downward force, can throw the would-be tackler off-balance. Too often I see players making a break with the ball tucked into the inside arm – which means they’d have to switch hands before performing a hand-off. Why not tuck it away in the outside arm first? I was asked to organise video analysis for a university women’s program last year. I agree with some who’ve resisted using it who believe that it’s tricky to utilize video of your own team effectively. Such coaches also want to be able to analyse the game real-time, and often from the touch line. I’m not that type of coach, so as long as there is someone to manage subs and injuries, I’ve no problem doing this myself. For others, they should ask a volunteer to do the shooting for them. A little ‘coaching’ is required in this, I feel, so that you can get the angles you want and include the components you want to see. I shot from behind the dead-ball line and was lucky to have side-on footage from one of the fathers. I like the end-on view as it allows you to see how your team uses the width of the field. The side-on is great for ball in contact and set-piece analysis along with being able to see what’s going on in the other end more clearly, but unless you are able to get very high, it is tough to gauge how the team is using space – a crucial factor in my game philosophy. With most rugby fields in Canada not having high bleachers or a clubhouse perch, I often find myself shooting end-on. Instead of playing the whole thing for the team and over-analysing every bit of the game, I’d pick 3 “Positives” and 2-3 “Work-Ons” to analyse. We’d play these back for the ladies the day after the game in a relaxed environment and start posing questions to allow them to tell us the reasons things worked or didn’t. It was a fantastic learning experience for them, and allowed us to see trends more clearly and support/correct them. The key in choosing the clips was to select the ones that highlighted trends in the match. In doing this for over a year now, I’ve found that even one can sometimes tell the story of a match – for example, poor body shape in contact leading to turnovers. And I can’t think of a match that’s had more than 3 big issues that played a significant role in a win / loss, so feel there’s no need to show the team the entire film. I do, however, make it available to those players who’d want it for personal performance analysis. I then went on to lead a high school girls program and decided this format wouldn’t be as effective as their level of knowledge and analytical skills wouldn’t be good enough for the quality of video we were using. But one thunder-stormy day instead of cancelling practice outright I hurried everyone into the computer lab and taught them how to do a simple ’cause/effect’ analysis. I picked a try (Ashley-Cooper’s wonderful try in Brisbane last year) and showed how something that looked so complicated was actually a simple result of timing and everyone doing their job well. I then put them into groups, making sure each had a senior player as leader and pointed them toward a favourite YouTube page with a lot of highlights. I challenged them to find one try they liked and as a group present to the rest of the team, using the Smart Board’s projector, “how and why it worked”. Some kids proved to be great at it and didn’t need any guidance. For the others, I didn’t give answers but kept posing questions which got them thinking more about how players move, consequences of depth and timing, etc. and they eventually provided the ‘right’ answers. The exercise allowed them to think about how a variety of individual and collective actions of other people can lead to successful or unsuccessful results. I gave them extra kudos at the end of the session as pretty much every try they chose exhibited relatively simple acts of teamwork that actually mirrored our strengths as a team. I reminded them that despite analysing professional athletes we were also capable of such inter-play because they had the talent and worked well as a team, and that the defences they saw weren’t as good so the potential to try such things and succeed should actually be greater!